On average, 16% of children and adolescents’ total calories come from added sugars. For kids aged two to five, an average of 13 teaspoons of sugar is consumed each day. And for adolescents ages six to 19, this number jumps to 22 teaspoons of sugar every day! The recommended limit is less than 5 teaspoons per day for preschool kids, elementary school children, and adolescent girls and between less than 9 teaspoons for adolescent boys. 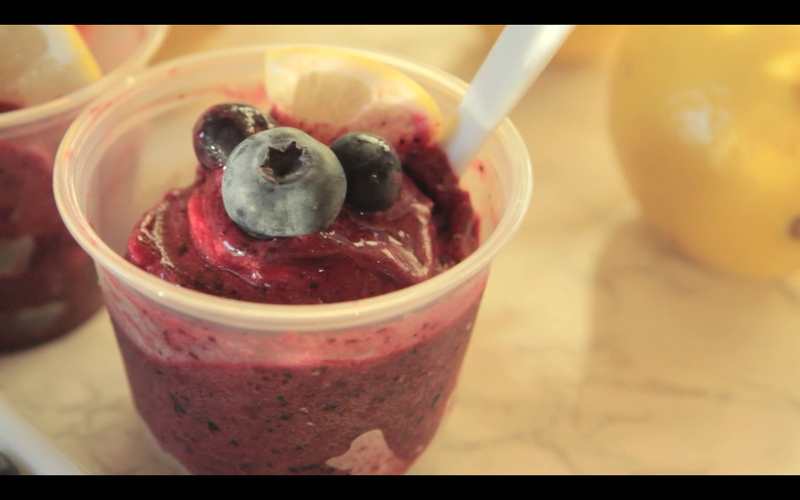 Fruit, like this frozen fruit whip, can be used as a refined sugar replacement to help youand your kids cut back on added sugars and create nutrient-dense treats and desserts. Click here to watch the step-by-step video. All kids, big and small, can benefit from adding more colorful foods to their diet. By eating a variety of colors, we can improve our intake of beneficial nutrients called phytochemicals. Phytochemicals help our bodies in a number of ways such as by aiding in heart function, preventing cellular damage, strengthening the bones, and fighting off illness. Because fruit is naturally sweet, it is a delicious way to get more protective plant compounds, called phytochemicals, in your kids’–and your own–diets. Ask your kids what their favorite colors are. Maybe they love radiant red cherries, brilliant blue blueberries, or pretty purple plums. Empower your kids with making choices to improve their health. Not only will they be getting the vitamins and minerals that their growing bodies need, but essential fiber as well! This is a crucial consideration because fewer than 40% of kids ages two to 17 meet their fiber needs. Aim for getting at least four different colors in your diet each day. Try making fruit whips as a satisfyingly sweet, nutritious treat that will help you meet your color goals. Use the Colorful Food Tracker to chart your progress! Simply select 1 cup of the fruit of your choice or combine flavors for a unique twist. If selecting fresh fruit, first wash, cut, and freeze the fruit. My favorite is frozen bananas which you peel first and then freeze in an airtight bag or container. Frozen fruit requires no additional preparation. Adults may prefer more sophisticated flavors such as blueberries blended with Meyer lemons, while kids may prefer just one fruit or simple flavors such as only mango or only cherry, or strawberries and bananas. Experiment with flavors to find out which ones are your favorites. Additionally, different flavors of fruits can be layered in a glass dessert dish for a vibrant and beautiful fruity treat. If you have any leftovers, pour them into popsicle molds and freeze them. This way you will have a healthy treat around when your sweet tooth is calling. This fruit whip is made with the Champion Juicer because it quickly and efficiently homogenizes the fruit with dozens of small blades, but you can also use a food processor or blender. Any frozen seedless frozen fruit of your choice. Cut fresh fruit into chunks that fit into the feeding tube. Freeze in an airtight container. 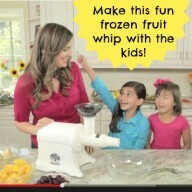 Or purchase ready to use frozen fruit. Fit the blank screen (or use homogenizing body) onto the juicer body. Run frozen fruit chunks through juicer into bowls, serve immediately. The best part is the Champion Juicer does all the hard work, so you don’t need to scrape out the side of the blender, start, and stop again. It comes out 100% smooth and ready to eat! Yum! Melissa Halas-Liang, MA, RDN, CDE is a Registered Dietitian and Certified Diabetes Educator with a Masters in Nutrition Education who is a nationally recognized childhood nutrition expert. She is founder of SuperKids Nutrition Inc. where she is “saving the world, one healthy food at a time.” Read more about her Super Crew children’s books and discover how nutrition can help you live your best health potential through her on-line courses blog, Melissa’s Healthy Living.